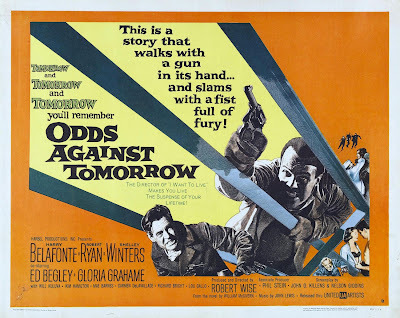 Odds Against Tomorrow was one of two films produced in 1959 by HarBel Productions, the other being the post-apocalyptic drama The World, the Flesh and the Devil. Producer/actor/singer/activist Harry Belafonte stars in both highly personal projects. Co-produced with the film's director Robert Wise, Odds Against Tomorrow is a black and white caper story with a message filmed on location in New York. The script is by the black-listed Abraham Polonsky from a novel by William McGivern. Depending on where you place yourself on the film-noir front, it can be considered either the end of the post-war noir cycle or the beginning of a new cycle. Note: neo-noir not recognized by this blog. Ed Begley (12 Angry Men, Sweet Bird of Youth) plays Dave Burke, a disgraced ex-cop with mob ties and a plan. He wants to make a lot of money, make it quick and get out. There's a bank in upstate New York ripe for the picking, but he needs two men with him for the job. He doesn't want pros. He wants desperate men looking for that one big take. Men he can control. Dave thinks he has the perfect set-up. The movie opens on an almost deserted NYC street in the autumn. In what I consider one of the best character introductions in noir, a lone man walks down the sidewalk, a grim and careworn Earle Slater played by Robert Ryan (The Set-Up, On Dangerous Ground). The street is not deserted as a group of children run in circles imitating the flock of geese above. A little girl stumbles and Earle bends and picks her up with a smile on his face and says "You're gonna break your neck trying to fly like that, you little pickaninny. Yes, you are." Like a kick in the gut, the sense of unease begins and never lets up. Earle is a loser. He's a two-time loser from the penal system. His last stretch was for manslaughter. He's just past his prime and sees no way out of a life sustained by the hard work of his too devoted wife Lorry played by Shelley Winters (A Patch of Blue, Night of the Hunter). Slater is a man "...not made for waiting and I've been waiting all my life". Slater is a man who hates himself and turns that hate outward. He is an active and unrepentant bigot. Robert Ryan was reluctant to take on the role of Earle Slater fearing comparisons to the anti-Semite Montgomery he portrayed in 1947s Crossfire and for which he received his only Academy Award nomination. In a 1959 interview in Ebony magazine, Ryan stated he thought it would be "a dangerous step for me to take professionally...audiences are composed of people with varying degrees of sophistication and understanding and there are many who do not separate actors from the characters they portray." Ryan relented after reading the script which he thought "says something of real significance and says it well, dramatically, without preaching." Johnny Ingram is played by Harry Belafonte (Island in the Sun, Uptown Saturday Night). Outwardly, Johnny is everything Slater is not. Johnny is handsome and pulled together. A nightclub musician, Johnny dresses in the best and drives a flashy car. The ladies love him. He exudes confidence and goodwill. Johnny is also a hopeless gambler who is deeply in debt to gangster Bacco played by Will Kuluva (Crime in the Streets). Burke will use Bacco to convince Johnny to take part in the heist. Dave needs someone of Johnny's skin type for the job. On another level, Dave seems to have convinced himself that his actions are benevolent as he likes Johnny and Johnny really needs the money. Johnny has one thing that means the world to him, his ex-wife Ruth played by Kim Hamilton (To Kill a Mockingbird) and daughter Edie played by young Lois Thorne. Johnny obviously adores Ruth and Edie, so why is the family broken? Johnny's gambling addiction is one reason. Ruth does not want the financial instability to be a part of Edie's life. Johnny and Ruth are also world's apart emotionally. Johnny is a man who is bowed down by fate and the deck that is stacked and will always be against him. He berates Ruth that it doesn't matter how much tea she drinks with her ofay friends, the world is not going to be any better for Edie and it's time she wised up. Johnny is unwilling to consider softening his conviction even if it stands in the way of the family life he craves. A couple of incidents convince Earle Slater to participate in the plan. One is when his self-loathing is exacerbated by cheating on Lorry with upstairs neighbour Helen played by Gloria Grahame (In a Lonely Place, It's a Wonderful Life). Johnny agrees to join the plan when Bacco threatens his family, but he senses doom, telling Dave "It's suicide, man. It's three o'clock in the morning." Too late Dave Burke discovers that the two seemingly perfect men for the job have issues that he can't control and that threaten his plan. T'was ever thus in the caper film world. Slater is an instigator while Johnny stands his ground. The desperation and hate boils over to an explosive finish that will have a touch of familiarity for gangster film fans. The score to Odds Against Tomorrow is by John Lewis and while jazz and film are not strangers, it is always a treat. The score, particularly Skating in Central Park remained an honoured part of the Modern Jazz Quartet repertoire for years. Legendary singer Mae Barnes is a joy trying to give the audience All Men Are Evil all the while being bedeviled by a drunk and sorrowful Johnny. There is an interesting mix of familiar faces to watch for in Odds Against Tomorrow including Cicely Tyson, Zohra Lambert, Diana Sands, Mel Stewart, Wayne Rogers, Bill Zuckert and Robert Earl Jones. How well the film combines all its aspects will be up to the individual viewer. The Golden Globes nominated Odds Against Tomorrow in 1960 for its long-defunct category Best Film Promoting International Understanding. TCM is screening Odds Against Tomorrow on Tuesday, September 10 at 6:00 am. It is well worth your time. Really great write-up of a terrific film! Robert Ryan (as you probably already know) is one of my great loves. I think he was sensational in nearly every role he ever took on, and even though these kind of angry, bigoted characters were light years away from the man he was in real life, he portrayed them completely believably. Although this film seems to borrow from "White Heat," I think it's a great noir, with fantastic acting by all. And we even get an opportunity to hear Harry Belafonte sing. Ryan is one of those legacy actors. My dad made me watch and appreciation him. I must say that the appreciation grows the more you see of his filmography. I always think of Belafonte as a singer first. He certainly is a renaissance man. I wonder how he views himself. Okay - if you say it's worth it, I will give it a go. This is normally the type of film I would bypass, but I'm trying to expand my horizons! FlickChick, I'll be interested in hearing your reaction to the movie. There are so many fine aspects to the film that I'm sure something will catch your fancy. I've never seen this one (and I LOVE Robert Ryan) -- I don't have cable, so I don't have TCM -- ACK! But I'll look for it and try to get a look at it. Robert is worth it! Thanks so much, CW! What a treat! I'm always so happy to see that Ryan, the consummate actor who can play deeply disturbed and frightening characters so well, is such a friendly and just plain nice guy. And what a man. As gorgeous as Harry Belafonte is, I'll take Ryan any day! Becky, you make me giggle. It's true. When Ryan is in good-guy-mode as in "The Boy With Green Hair", you'd trust him with your life. When he plays a bad one - well, you'd cross the street if you saw him. How did this fall off my radar? Thanks for the heads-up. You need your own column in the TCM "Now Playing" guide. I agree with Jacqueline T Lynch; you SHOULD have your own column in the "Now Playing" guide. Who do we speak to about that? This sounds like a great film, one that a film noir fan MUST see. Thanks for recommending. Ladies, thank you both very much. I'll be walking a few feet off the ground for the rest of your day for the compliment. The movie is one that will stay with you. You really knocked this review out of the ball park, Patricia. Your writing is wonderfully evocative of this bleak, truly haunting black and white film and I loved the background insights you provided as well. Thanks so much for sharing your take on this movie. Thank you very much, Moira. I had hoped to do the film justice.